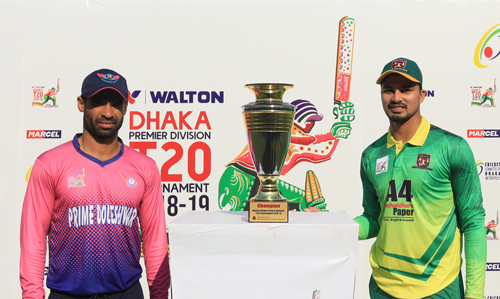 Sheikh Jamal Dhanmoni Club Ltd. become the champion of Walton Dhaka Premier Division T20 Tournament 2018-19 by beating Prime Doleshwar Sporting Club by 24 runs in the final at Sher-e-Bangla National Cricket Stadium. Batting first, Sheikh Jamal posted a fighting total of 157 for 7 in 20 overs thanks to Imtiaz Hossain’s half-century. Skipper Nurul Hasan chipped in with 33 while Tanbir Hayder played an 15-ball 31-run cameo to help his side score past the 150 runs mark. Farhad Reza claimed wickets for 32. In response, Prime Doleshawar were off to a flyer as Saif Hassan and Mohammad Arafat added 55 runs in the opening stand. Their partnership were broken after Arafat retired hurt on 35. Doleshwar then lost the plot as they kept losing wickets in regular intervals and reduced to 88 for 5 in 16th over. But skipper Farhad Reza kept his side in the game till the last over and played an blistering knock of 45 off 20 balls. His effort was not enough as Doleshwar fell 20 runs short and ended on 133 for 8 after 20 overs. Shahidul Islam picked up 4 wickets for 19 for Sheikh Jamal. Batting first, Sheikh Jamal posted a fighting total of 157 for 7 in 20 overs thanks to Imtiaz Hossain’s half-century. Skipper Nurul Hasan chipped in with 33 while Tanbir Hayder played an 15-ball 31-run cameo to help his side score past the 150 runs mark. Farhad Reza claimed wickets for 32.